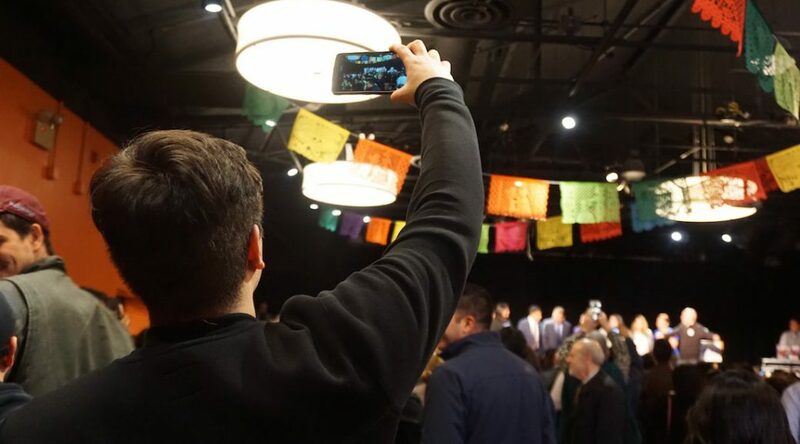 “Our Chicago working class and immigrant values are alive and well tonight,” he told more than 100 people at his victory party, held at the National Museum of Mexican Art in Pilsen. Garcia spoke first in English and then in Spanish. In both languages he recited the story of a Mexican immigrant who became a citizen on Election Day and cast his first vote within hours. “This is what awaits the immigrant experience of many people in our country,” Garcia announced to the cheering crowd. Constituents see his background—a political ascent riddled with defeats—as proof of a tenacity that he will unleash in Congress. Garcia lost his 1998 re-election bid to the state senate and his 2015 mayoral bid, but pivoted to other opportunities both times. Chaidez, an army veteran, took the day off from his job at Comcast for the first time in 13 years to campaign for Garcia and two alderman hopefuls in four polling stations across the Southwest Side. He remembers seeing Garcia for the first time in the mid-1980s when he was just a child. Garcia, an alderman, was standing beside Chicago’s mayor, Harold Washington. Chaidez’s grandmother told him to pay attention because she believed Garcia was going places. Garcia emigrated to Chicago with his family as a 10-year-old and lived in the predominantly Latino Pilsen and Little Village neighborhoods. His debut as alderman of the 22nd Ward in 1986 marked his entrance into the political sphere. In 1992, he left to become the first Mexican-American in the state senate. A Cook County commissioner since 2010, he forced Mayor Rahm Emanuel into a 2015 runoff before losing. His election party also celebrated the victories of five newly elected officials from the Southwest Side: state representatives Aaron Ortiz (1st District), Theresa Mah (2nd District) and Celina Villanueva (21st District), Cook County Commissioner Alma Anaya (7th District) and Judge Beatriz Frausto-Sandoval (14th Judicial Subcircuit). Four of the five officials are young women of color. Southwest Side residents at Garcia’s watch party, including Francisco Herrera of Berwyn, lauded the increased representation of Latinos and women. Herrera, 66, was born in Durango—the same Mexican state as Garcia—and emigrated to Chicago at age 16. A Southwest Side resident for 50 years, he has gotten to know Garcia personally. He describes him as dedicated to the community and hopes Garcia’s voice in Washington sparks improved measures against discrimination and yields equal treatment of women and men. Amid the celebrations, Garcia acknowledged a looming task: Delivering on his campaign promises of single payer healthcare, affordable housing and immigration reform. The freshman representative will need to focus heavily on his proposed immigration reforms if he expects to satisfy constituents who canvassed for him, including Tanya Patino, 28, a civil engineer from Archer Heights, and Clarissa Ortiz, 17, the younger sister of Illinois Rep. Aaron Ortiz. Patino hopes Garcia will spearhead reforms to counteract the Trump administration’s vocal opposition to illegal immigration. The president routinely closes his rallies by chanting “Build the wall” alongside his supporters, and most recently has demonized the Central American caravan carrying refugees seeking asylum.